It was all for a good cause, raising money for cancer and leukemia research. 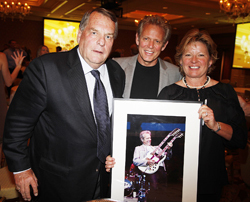 Former Danny Thompson Memorial golf tournament board chairman Brad Corbett of Fort Worth, Texas, left, spent $13,000 Friday night at the annual event’s live auction in Sun Valley to purchase local photographer David N. Seelig’s photo of Rock and Roll Hall of Famer guitarist Don Felder, center. Corbett, the Texas Rangers chairman/majority owner from 1973-79 who has been involved with the Thompson Memorial since its inception in 1977, then donated the framed photo of Felder’s Wednesday night performance in Sun Valley to Thompson Memorial president and tournament director Georgie Fenton, right. The bidding was heavy for Seelig’s photo, and two other bidders also paid $13,000 for copies of the print. Who will govern new airport?